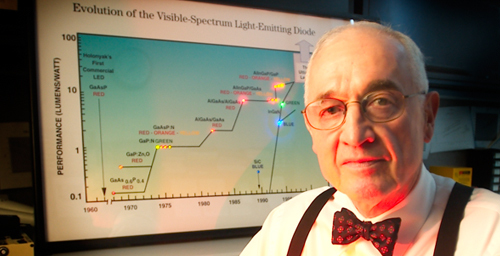 Nick Holonyak Jr., the Bardeen professor of electrical and computer engineering, will be inducted into the Engineering and Science Hall of Fame for his development of the first practical light-emitting diode (LED). CHAMPAIGN, Ill. — Nick Holonyak Jr., a renowned innovator of semiconductor devices, has joined the elite ranks of scientists and inventors inducted into the Engineering and Science Hall of Fame. 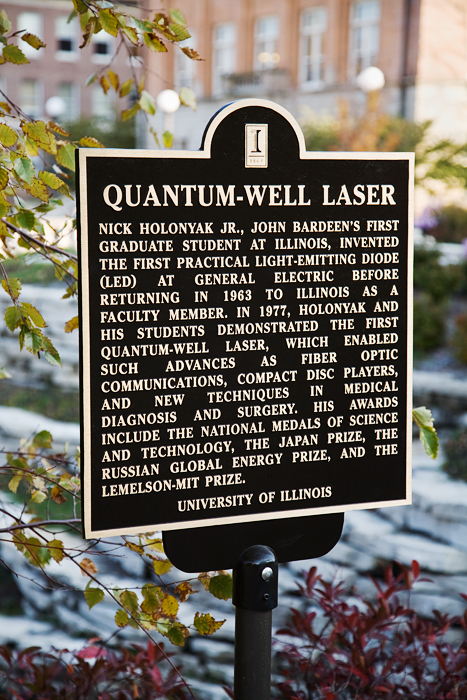 Nick Holonyak Jr.'s innovations are noted on one of the campus historical markers. Holonyak is recognized for his invention of the first practical light-emitting diode (LED). He will be inducted at a ceremony in Dayton, Ohio, on Nov. 3, along with Nikola Tesla and James Tsui. The 2011 inductees join more than 50 great names in the history of science, including Thomas Edison, Enrico Fermi, Jonas Salk and the Wright brothers. Holonyak, the John Bardeen professor of electrical and computer engineering and physics at the University of Illinois, is a pioneer in the field of optoelectronics – devices that convert electricity into light or vice-versa. He gained eminence through his numerous inventions and contributions to advances in semiconductor materials and devices. His work has resulted in more than 500 academic papers and 51 patents. Alison Davis Wood and Tim Hartin were nominated for an Emmy Award for their Big Ten Network documentary, "A Brilliant Idea: Nick Holonyak and the LED." LEDs, semiconductor crystal devices that emit light when electrified, now are commonly used on items ranging from instrument panels to bicycle tail lights. In a different form, LEDs can function as lasers. His innovation also has contributed to technology in household dimmer switches, lasers that run CD and DVD players and fiber-optic communication. Most recently, Holonyak has worked with U. of I. electrical and computer engineering professor Milton Feng to demonstrate the operation of a transistor laser that combines the functionality of both a transistor and a laser by converting electrical input signals into two output signals, one electrical and one optical. 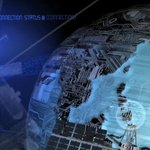 Transistor lasers could dramatically improve the speed and availability of electronic communications and computers. Holonyak, Bardeen’s first student, earned his bachelor’s, master’s and doctoral degrees at the U. of I. He then worked for Bell Labs, the U.S. Army Signal Corps, and General Electric before joining the faculty at Illinois in 1963. Among his numerous awards are the Lemelson-MIT Prize (2004), the Global Energy Prize from Russia (2003), the U.S. National Medal of Technology (2002), the Japan Prize (1995), the National Academy of Sciences’ Award for the Industrial Application of Science (1993), and the U.S. National Medal of Science (1990). He is a member of the National Academy of Engineering, the National Academy of Sciences, and the National Inventors Hall of Fame; as well as a fellow of the American Academy of Arts and Sciences, the Institute of Electrical and Electronic Engineers, the American Physical Society, and the Optical Society of America. He is a foreign member of the Russian Academy of Sciences. The Engineering and Science Hall of Fame is an international organization dedicated to honoring national and international achievements in science and engineering and to preserving the legacy of those whose contributions have shaped history and improved quality of life.